Our graduates will excel in their choice of veterinary/biomedical careers. We will advance global animal and human health and well-being through transformational and interdisciplinary research. We will be a recognized authority for animal and public health through collaborations in medical care, diagnostics, education and discovery. The mission of the Purdue University College of Veterinary Medicine is to advance global animal and human health and well-being through excellence in learning, discovery and engagement. 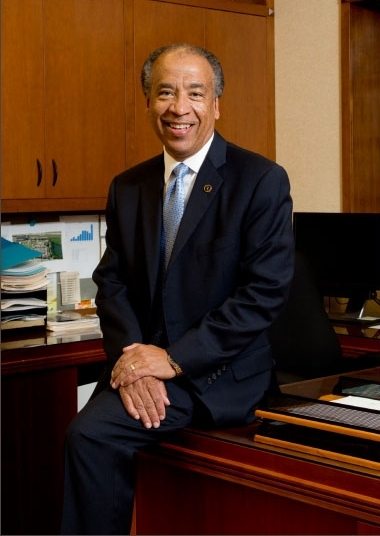 I am pleased to share with you this summary of the Purdue University College of Veterinary Medicine’s Strategic Plan, which reflects months of study, analysis and creative thinking about the future of veterinary medicine. As you will see in this summary, our plan for the period of 2015-2020 is more than a blueprint to guide budgets and decision making. This plan utilizes a matrix that links our strengths to several focus areas through which we can uniquely and profoundly influence and advance veterinary medical education, discovery and engagement. Most people have heard the story about the silly villager who would shoot an arrow at a blank wall and draw the bullseye afterward. We chuckle because we have a sense of how hard it really is to hit the center of a target from any distance. That’s why this plan identifies our target areas without presuming that we are immediately ready to start launching arrows. We will develop, through thoughtful and structured methodology, specific initiatives to achieve our goals in each focus area as we move forward. The result of this process will be significant and measureable progress toward fulfilling our mission of advancing global animal and human health and well-being through excellence in learning, discovery and engagement. Our achievements will build on key attributes of our College that were affirmed through this strategic planning effort: we are welcoming; we are committed to increased diversity; we are like a family in our compassionate commitment to ensuring everyone’s success; we treasure our College’s heritage of providing excellent handson education to train students that are “career-ready;” we are entrepreneurs in medical discovery; and we love our profession and its potential to improve the health and well-being of animals and people. I want to express my thanks to all of the faculty, staff and students who participated in the development of this plan, and all of our stakeholders who provided valuable feedback by responding to surveys which were conducted at the beginning of the strategic planning process. Recognizing the value of hearing a wide range of perspectives, my goal was to be as inclusive as possible in creating this plan. Guided by a capable and experienced consultant, we forged this plan through extensive discussion and analysis and the final version was reviewed by our faculty in April 2015. These are exciting days for our College as we embrace the challenges and opportunities that lie ahead. This is a time for confidence and boldness as we begin this next chapter in the story of Purdue Veterinary Medicine and I hope, as you have the opportunity, you will join us on our journey forward. 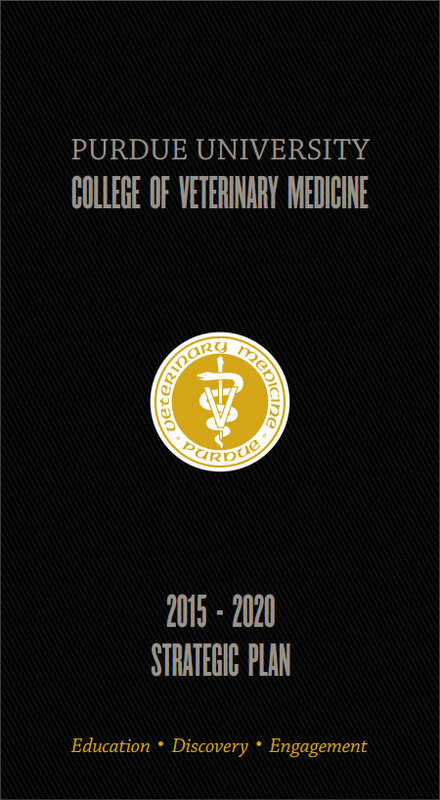 The Purdue University College of Veterinary Medicine’s Strategic Plan for 2015-2020 synthesizes the creative input of our faculty, staff, students and stakeholders into a game plan for our future growth and development. The inclusive nature of the strategic planning process resulted in a unique plan format that correlates focus areas across three broad strategic themes. The development of the plan involved true teamwork aided by an external facilitator. Initially, College stakeholders provided feedback through internal and external surveys, and the survey results were evaluated at a faculty retreat. Next, teams of faculty and staff proposed objectives within the broad strategic themes of education, discovery and engagement. Through the work of these teams, several focus areas applicable to all three strategic themes emerged, leading to the development of a strategic plan matrix by the College leadership. The team oriented approach was appreciated and critical to developing our vision for continuous improvement while upholding our core values. Strive for excellence in all aspects of our work. Promote a collegial work and learning environment enhanced by diversity. Emphasize innovation and delivery in our learning, discovery, and engagement programs. Actively support individual development of our faculty, staff, and students such that they can achieve their full potential as biomedical scientists, professionals, and individuals. Encourage collaborative, multidisciplinary discovery programs providing a continuum of basic science to applied research benefiting both animal and human health (i.e., translational research). Encourage participation in activities that enhance the veterinary profession and the reputation of the College. Purdue University College of Veterinary Medicine seeks to globally advance animal health and welfare and human health through excellence in learning, discovery, and engagement, as the leading veterinary college for comprehensive education of the veterinary team and for discovery and engagement in selected areas of veterinary and comparative biomedical sciences. These three themes are the driving force behind this strategic plan. Purdue Veterinary Medicine (PVM) strives for continued programmatic excellence which is only accomplished within supportive work and learning environments. Our PVM strengths were readily apparent throughout the planning process and emerged as focus areas which extend across all strategic themes. PVM educates career-ready veterinarians, technicians, and scientists who are prepared to enter diverse types of positions in private practice, industry, government and academia. PVM is one of only four veterinary colleges in the U.S. that educates all members of the veterinary team. PVM faculty collaborate with scholars in other colleges on the Purdue University campus, in the Indiana University School of Medicine, and, indeed, with scientists at universities, research institutions and companies across the U.S. and abroad. PVM embraces the importance of agriculture to Indiana and the world. Our veterinarians lead teams of scientists to solve problems affecting human and animal health and to protect the safety and security of our food supply. PVM values our faculty, staff, and students as our greatest resources. Investing in development opportunities that advance both the technical and non-technical skills of our PVM family is essential for advancing scholarship and excellence. PVM recognizes the need for new facilities and has created a master plan for a new veterinary medical complex. Building a new veterinary teaching hospital is of highest priority. In the interim, PVM continues to invest in equipment and facilities to provide state-of-the art clinical and diagnostic services, cutting-edge research, and modern learning environments for our students. Our vision is that PVM graduates will excel in their choice of Veterinary/Biomedical careers. Our vision is to advance global animal and human health and well-being through transformational and interdisciplinary research.